The Charlotte Caballeros, Greenville Energía, Rápidos de Kannapolis, Winston-Salem Rayados and Tortugas de Daytona will take the field in 2018. New-look teams will take the field across the Minor Leagues this summer. From Eugene to El Paso to Brooklyn, prospects will thrill fans in fresh logos, bold designs and never-before-seen uniforms. But baseball isn't expanding. It's getting more colorful. 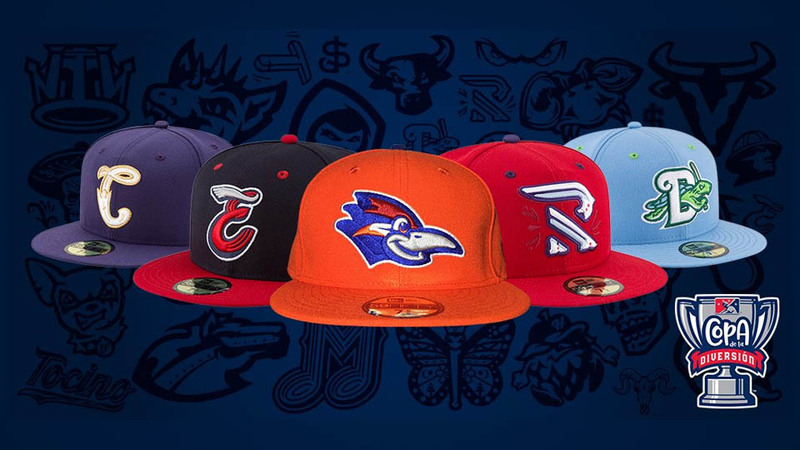 Minor League Baseball unveiled alternate identities for 33 teams Tuesday as part of its recently announced Copa de la Diversión initiative. For select games this year, the Mariachis de Nuevo Mexico will take the field in Albuquerque. The Durham Bulls will become the Toros. Omaha's Storm Chasers will lace up their spikes as the Cazadores de Tormentas. And the Minors will welcome back the Las Vegas Reyes de Plata and Charlotte Caballeros. A vast component of the "It's Fun to be a Fan" marketing campaign Minor League Baseball introduced last year provides outreach to underrepresented fan communities across the Minors. Hispanic fans, perhaps the largest untapped demographic, embraced the pilot program last year in eyebrow-raising fashion. "The other side of the coin is Nielsen Scarborough, where they look at the attendees. That's who they survey, and of their big survey, they extrapolate that Minor League Baseball has between 1.8- and 1.9-million unique attendees among our 14.5 million [attendees per season] that are Hispanic. You take the two numbers together, and there's a 10.3 percent fan-to-attendee conversion rate. We have far more fans than we do attendees, so that became the lights in neon for us specific to this campaign." Internal Minor League Baseball research confirmed Nielsen Scarborough's unique attendee figure and showed most clubs were not drawing from their potential local Hispanic fan bases proportional to their population. Inspired to do more, last year four teams rolled out Hispanic-inspired identities as part of their outreach -- the Reyes de Plata and Caballeros were joined by the Visalia Toros and Kane County Cougars, who kept their name but donned unique uniforms for the initiative. Before any of them took the field to play a game with their new looks, they'd sold out of all their caps. "We learned a lot in 14 games in one month [last August]," Hunzeker said. "The four clubs that were part of the pilot program were phenomenal in sharing their insights. There were some things we thought were slam dunks that did not take off. There are things that we didn't even consider that bubbled up to the forefront. We learned a lot and picked up on opportunity areas, so as we went into recruiting clubs for 2018, we were armed with a lot more data than had we not done the pilot program." Charlotte, Kane County, Las Vegas and Visalia provided a template for the rest of the Minors. "Each of those four represented what our research segmented as markets by type," he said. "Las Vegas is the large market with a Hispanic heritage and pretty significant history. Charlotte's a large market with more of an emerging Hispanic marketplace, a lot of second-generationers, Millennials, Gen-Zs. Kane County was the suburban market. You can align Gwinnett underneath that. Some of the Los Angeles-area teams would follow that. And Visalia's the small market. I can take the 160 and effectively split them up into each of those four categories." Hunzeker presented material on the program to clubs at the 2017 Baseball Winter Meetings and was overwhelmed by the response. "They saw even in a 14-game subset or initial run, they saw it combines everything that we do right [in Minor League Baseball]," he said. "It's all about the fun. It's all about the food. It's all about the music. All we need to do is welcome Hispanic fans into the ballpark." Minor League Baseball and the 33 teams now part of the Copa de la Diversión worked together to craft special new identities. "We're really, really good at brand elasticity at the club level," Hunzeker said. "There are teams that have alternate brands of alternate brands at this point, and people love them. Our fans love these identities. "What all of these food-centric, or for example, the Corpus Christi Blue Ghosts [have in common], they're all community specific. You could not be the Blue Ghosts in Omaha. It wouldn't make any sense. That's why it works. That doesn't mean that somebody in Omaha won't think that's a pretty awesome logo and they're going to buy it online. That's certainly happening." It happened with last year's four teams, too. Heading into 2018, clubs ran with their ideas. Working in conjunction with Minor League Baseball and local Hispanic chambers of commerce or similar organizations, teams across every level from Class A Short Season to Triple-A and representing 19 states are taking part. MiLB created 23 of the 33 teams' looks from their primary logos to cap and uniform designs. Teams vetted their name and logo ideas through business and personal connections with organizations in their local Hispanic communities. The result is a stunning panoply of colors, symbols, names and designs. Among them, six teams will go with Spanish translations of their normal moniker. The four teams that took part in last year's pilot program will have new colorways. Clubs such as Albuquerque (Nuevo Mexico) and Bowie (Chesapeake) opted for a more regional title. And then there are the Monarcas de Eugene. "What Allan Benavides did in Eugene, Oregon with their name and who he worked with in their local community is my new model," Hunzeker said of the Eugene Emeralds general manager inspired by the monarch butterfly, adopted by activists as a symbol of peaceful migration. "He did an exceptional job in coming up with the identity. There's so much symbolism in there that it's hard to understand, but effectively in one logo, he was able to represent every Hispanic country of origin in the Western Hemisphere." The Copa goes far beyond just names, logos and uniforms. Teams have devoted resources to ensuring the presence of full-time and gameday bilingual staff members and have expanded outreach to local schools, clubs and organizations. "The culturally relevant on-field persona is really the visual, but the reason is our clubs' ongoing commitment to their communities -- not just the Hispanic community but everyone involved," Hunzeker said. "The 33 clubs participating in the Copa de la Diversión program this year have committed approximately $500,000 in marketing resources to better engage their Hispanic consumers in their markets. That's the very definition of commitment. They've reallocated their marketing funds to go after this vitally important, financially powerful, young [demographic]." Each of the 33 clubs picked how many games they wanted to play as their alternate identity. Minor League Baseball urged three apiece. The teams will average five. "We're not one-hit wonders," Hunzeker said. "This is not Hispanic Heritage Night. This is a commitment to having more than one game, and each of the clubs fully committed to that." The expanded program will give Minor League Baseball vastly more data to measure its impact in different metrics from what nights of week work best to what merchandise and food items sell hottest. As the name would suggest, "Copa" refers to a real trophy that will tour the homes of the 33 teams based on a schedule of days they'll be their alternate identities. At the end of the season, it will be awarded to one team based on a formula built from a series of different factors such as converting fans into new attendees, how new foods are received, merchandise sales and more. At the end of the year, each team will auction its jerseys and hats to benefit a designated local charitable organization. "You take the clubs' commitment to really representing their communities, and we were off and running," Hunzeker said. "We ended up with 33 teams for 2018 with 38 formal emails and/or phone calls of other teams saying, 'We're in for 2019.' Ultimately next year, I think we'll end up with 70 or 80. "The clubs, I can't give them enough credit. They owned every part of this. We were just happy to provide insights and assistance as requested. This has been a three-year labor of love." Beyond all the fun elements, there could be a baseball benefit that comes with it. In 14 combined games last year, the four pilot teams went 12-2.